2018 Real Estate ~ What Will it Bring? What Makes A Stylish Home? Well, some might argue that it’s a great couch, while others may say it’s in the attention to detail. However, one thing is for sure, there are people who just seem to know what works and the same goes for their personal style. They are often the people we see on Instagram whose bedroom colour palettes always match their #ootd(outfit of the day) but how do they do it? Well according to Lyz Lynch of mydomain.com, there is an actual list. Time to take notes! Some examples of how you can add plants. You know you’ve seen them and wondered “wow, this blanket looking thing is really cool” and yes, throws are pretty amazing. They add an effortless luxury to living and bedroom spaces. Drape it over your couch or bed to create a look that will bring your space together. A touch of vintage to your wardrobe is just as coveted when it comes furniture. Whether it be your aunt’s inherited vase or a chair or an ornament that you bought on a trip you took a few years ago, vintage items go beyond just being beautiful because they’re priceless too. Nothing adds personality and colour to a space the way an art piece does. An interesting art piece can really act as a centrepiece of a space where you don’t really need much else; invest on a timeless piece that speaks to your taste. Whether it be a chandelier or an unusual table – take a risk and choose something that really shows off your quirky or eclectic side. A statement can be made in a variety of ways; a colourful couch, a cool chair or a light piece. Now that you have all this inspiration, we certainly hope that you are excited to make some changes as you usher in the new season. When Brooklyn-based radio producer Miki decided to treat herself to her dream bathroom, she called on Homepolish, an interior design start-up that only charges a flat hourly fee, to take her to the promise land. Let’s just say that Homepolish delivered. To modernize Miki’s outdated bathroom without losing its prewar charm, Homepolish interior designer Sandie Tsai chose a black, white, and gray palette accented with pops of brass. While it’s not the largest bathroom, you hardly notice thanks to the luxe materials and strategic design decisions. Keep reading for the full tour and Sandy’s smart renovation tips! While brass details pair well with black and white, Sandie was careful not to overdo it. To keep it tasteful, she balanced the flashy brass with more subdued oil-rubbed fixtures on the sink. Limiting the palette to two or three colors and playing with texture helped make the small bathroom appear to be much larger. Marble subway tiles on the wall and black tiles with light grouting on the floor add subtle pattern and richness. Hot tip: using elevating pieces like the clawfoot tub also gives the illusion of added space. The glamorous brass hardware allows for the best of both worlds — a soaking tub that can also work for quick showers. Painting the small window frame black also helps draw the eye up toward the ceiling. A bath tray makes it easy to keep products (or even a good read) dry and at the ready during bath time. Another perk of a small bathroom? It’s much more affordable to indulge in luxurious materials, like marble subway tile for the walls! A small floating shelf makes it easy to create beautiful and meaningful vignettes, something that can add loads of personality to a bathroom space. We can’t help but gush over these nautical-inspired sconces. A bud vase on the sink kicks the glam factor up a notch. Two whimsical art prints hang above the tiled portion of the wall. Why not take advantage of the space above the toilet? Sandie styled it with jars filled with Q-tips and cotton pads, bath products, a reading book, and a chic trinket box. For many people, the prospect of downsizing from a larger home to a smaller one can be quite the challenge. Sorting through possessions takes time. It can be emotionally taxing. It can be liberating. 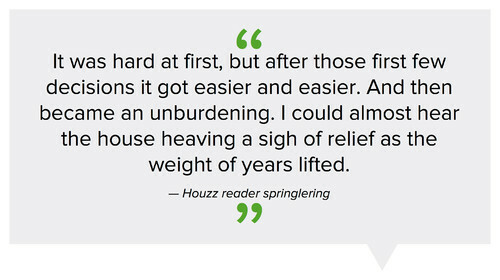 We asked Houzz readers to share their best downsizing advice, and share they did. 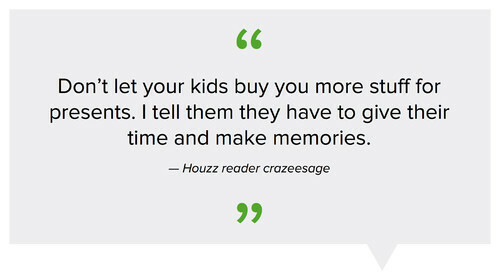 We gathered some of the best tips below. Step 2: Decide what to get rid of. Often the most difficult part of downsizing is deciding what to let go of. “Holding on to our past, whether in the form of corporate work clothes or hefty grad school books, can be tempting because it feels comfortable,” writes Houzz contributor Laura Gaskill. She advises spending time gaining clarity on your vision and goals for the next few years. “What are you still holding on to that doesn’t mesh with that vision?” she asks. In the kitchen, it’s wise to keep appliances that are multipurpose and frequently used, says Houzz reader Anthony Perez. “If you entertain at all, don’t scrimp on the table and chairs,” adds bonniedale22. Downsizing is also an opportunity to adopt a minimalist mindset with your wardrobe, according to Houzz reader andrealew, who recommends keeping on hand only enough clothes for a three-week vacation or, if you will be living in a place with seasons, three weeks per season. Some readers advised not burdening family members with discarded possessions, while others noted the wisdom of at least asking your family members if they would like any of the belongings before you toss them. It can also be helpful to involve an organized friend, someone you can trust to help you decide what to keep and what to let go. For seniors who would be comforted by a sense of familiarity in their new surroundings, take a photo of the furniture layout and replicate it as best as possible in the new place, advises simplynancy. And on that note, taking photos of prized possessions, whether parts of a collection or simply something with a lot of memories, can make the letting go a little easier. Houzz reader AJ advises something unexpected: waiting until after the move to see what won’t fit and getting rid of items then. “This is counter-intuitive and goes against everything you’re always taught, but I wish I had done it,” AJ says. 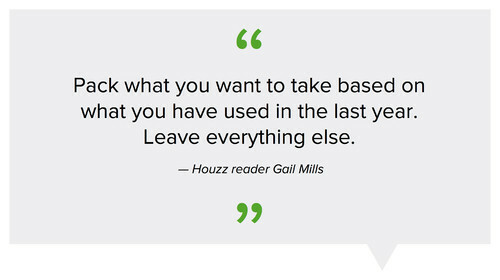 A final word: Go easy on yourself, and be proud that you’re tackling a downsize. It will take some effort, for sure, but you’ll get through it, with a reward of a lighter lifestyle on the other side.